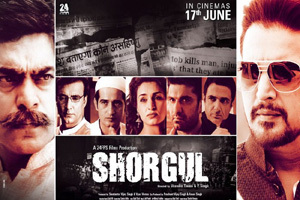 Shorgul is a 2016 bollywood, political thriller film directed by Pranav K Singh and Jitendra Tiwari, The film is jointly produced by Swatantra Vijay Singh and Vyas Verma. The film stars Jimmy Shergill, Suha Gezen, Ashutosh Rana, Narendra Jha, Anirudh Dave, Hiten Tejwani and Sanjay Suri in lead roles. The soundtrack of film is composed by Lalit Pandit and Niladri Kumar, with lyrics penned by Kapil Sibal. Here is the link of all the songs lyrics and videos of Shorgul.